The Wisconsin Museum of Quilts and Fiber Art, Cedarburg, Wisconsin, will host a Gallery Night on Friday, June 8, 2018, 5 pm – 7 pm. 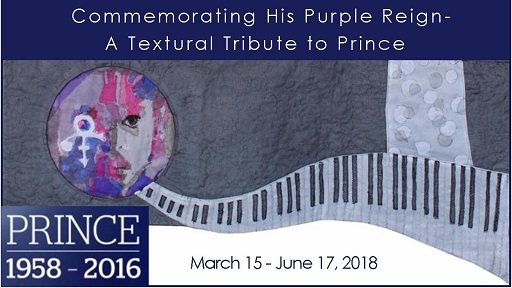 The current exhibit, Commemorating His Purple Reign: A Textural Tribute to Prince, is a Textile Center touring exhibition, juried by Dr Carolyn Mazloomi, featuring 25 art quilts honoring the life and art of Prince. Karl Reichert, Textile Center Executive Director, will attend and share some of the background about the creation of the exhibition and Textile Center. The exhibition closes June 17, 2018.